Cats are the most intriguing, wonderful, and yes – strange – creatures. In many ways, they are much like having a nearly wild animal living among us, sharing our homes, our sofas, and even our beds. If they are allowed the freedom to roam, we feel honored when they grace us with their presence. If they bring in prey to showcase with pride, we may feel appalled, but we also secretly share that pride. Their ability to purr is a marvel. Their obsessive need to self-groom is a great perk. And the fact that many of them crazily react to catnip is a delight, as well as a mystery. 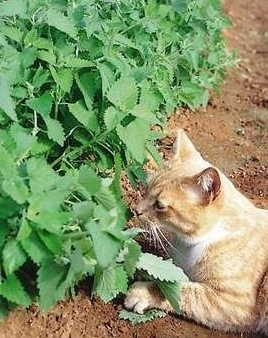 Just what is it about catnip? The surprising fact is that there aren’t many facts about why and how it affects cats. What is known about the herb known as Nepta is that it’s a member of the mint family, as well as a distant relation to Cannabis, otherwise known as marijuana. However, it only affects cats, and in particular domestic cats, although there are reports that lions and tigers are susceptible to the essential oil in catnip that sends them into some sort of mental orbit. It is also known that not all cats react to catnip. The inclination is genetic, and interestingly, very few cats in Australia are affected. Overall, about 30 percent of the cat population could give a hoot. Kittens don’t react until they reach sexual maturity, which leads researchers to believe that the operative oil in catnip stimulates a cat’s pheromonic receptors, which is the same area of the brain that affects sexual arousal. Reactions also differ, and range from rolling, flipping, slobbering, and licking. Some cats will growl and even become aggressive. The effect only lasts for up to 15 minutes, and then wears off until their brain becomes susceptible again, usually after about an hour. The general understanding is that catnip is not harmful. However, little research has been conducted about the effects of catnip — no brain scans while under the influence; no studies of long-lasting effects. But cats have been “enjoying” the stimulation of catnip for centuries and continue to thrive. Plus, it’s fun to give our kitties a little snort sometimes and watch them lose their dignity for a few minutes. They don’t seem to mind. Catnip as the herb is almost as interesting as cats are themselves. It’s a known sedative when ingested (by both cats and humans) and it also serves as a potent insecticide, especially against mosquitoes. As a tea, it can ease indigestion and also activate uterine contractions, so it should be avoided by pregnant women. It is easy to grow and likes sandy soil and full sun. 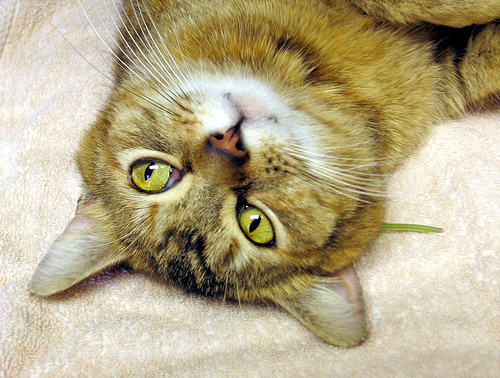 To dry fresh catnip, hang it upside down in a dry, ventilated area, such as an open bedroom closet. Rubbing, or bruising, the dried catnip will activate the essential oil that will make your cat crazy, if he’s so inclined. It’s no wonder that cats were once thought to be the companions of witches. The mystery of their little minds, especially under the influence of catnip, is still to this day a little spooky. My neutered cat never really cared for catnip – perhaps it was because he never really matured? Interesting. I thoroughly enjoyed reading this, thanks again for an intriguing article!